Save money and enjoy delicious coffee drinks at home this summer! 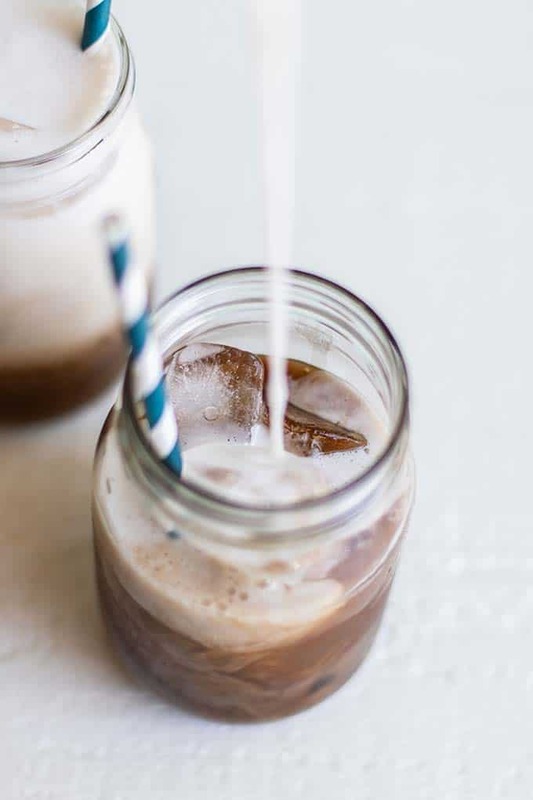 You’ll love this Salted Caramel Mocha Iced Coffee Concentrate — made with either cold brew coffee, or save time by using instant coffee. Starbucks is a small obsession of mine. Maybe not such a small obsession. Everyone knows it’s my weakness. I love my iced coffees, and I’ve been known to spend quite a lot of money at Starbucks. After I started making coffee concentrates, like this Salted Caramel Mocha, my trips to Starbucks became less frequent because making treats like this at home costs pennies compared to dollars. I often make this with Cold Brew, but if I don’t want to wait a day for that to be ready, instant coffee works also. It stays fresh in the refrigerator for a week. Cold brew is extra smooth and rich. It’s so easy to have on hand, and stays fresh tasting about 3 days. Instant has a lot less caffeine that cold brew or drip coffee. I like to make a large batch of this coffee concentrate to have in the refrigerator for a week. When I am ready, all I need to do is add some almond milk or coconut milk and I’ve got a frosty, lightly sweet, rich and chocolatey coffee. Easier than running to the coffee shop, I swear. Starbucks Salted Caramel Mocha has nothing on this. I don’t order sweetened drinks when I am out. I don’t like the taste of regular sugar, and I don’t like how it makes me feel. sea salt (you’ve got to do it! It’s not caramel without it). Once the cold brew is ready, I soak the dates in hot water (or if I am using instant coffee, it’s okay to soak the dates directly in the hot coffee). Toss the coffee along with the rest of the ingredients into the blender, and process until the beverage is completely smooth. It’s okay to drink the coffee directly out of the blender, but I find it tastes a little “thick” from the date and cocoa sediments. I like to strain the concentrate through a nut milk bag (cheesecloth would work). What milk do you enjoy in your coffee? There is a plus to each of the different options! ⭐️ Regular Milk: Great if you can tolerate it because it adds protein! ⭐️Almond Milk: My “milk” of choice – low in calories, and still very creamy! ⭐️Low Fat Coconut Milk: I adore coconut milk in coffee, but find the light kind blends better into drinks. Depending on which option you choose, you could save quite a bit on your coffee habit! $1.66 for TWO 16-oz drinks, or just $0.83 per coffee. 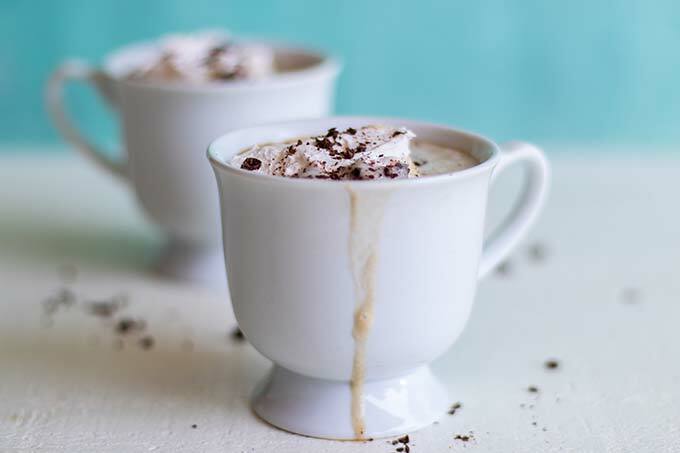 A lightly sweet mocha made with a caramelly flavor, using sea salt and dates. Add a bit of butter extract to really exaggerate the caramel flavor, but I find the sea salt does the trick. I make this with cold brew, but instant coffee works in a pinch. 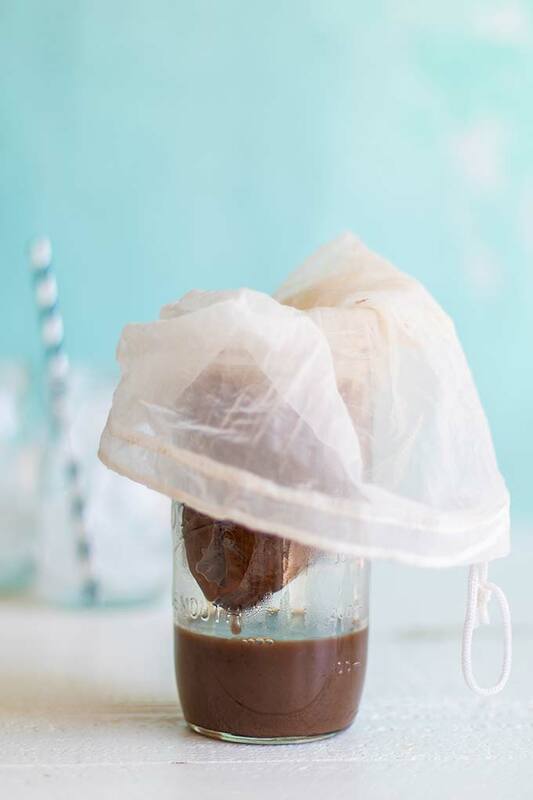 If making this with cold brew, first soak the dates in hot water for a minute or two. Drain, and then add to a blender with the rest of the ingredients. Process until very smooth. If making with instant coffee, add the instant coffee to a large container, and then add 4 cups of hot water. Add the dates and allow to soak for a couple of minutes, before adding to a blender with the rest of the ingredients. Process until smooth. 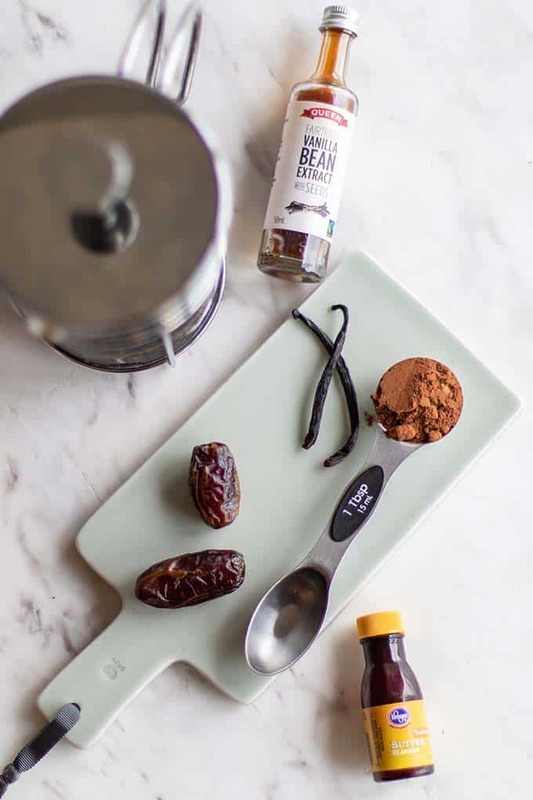 To make the smoothest coffee, strain the date and cocoa sediment out by straining the coffee concentrate through a nut milk bag or cheese cloth. 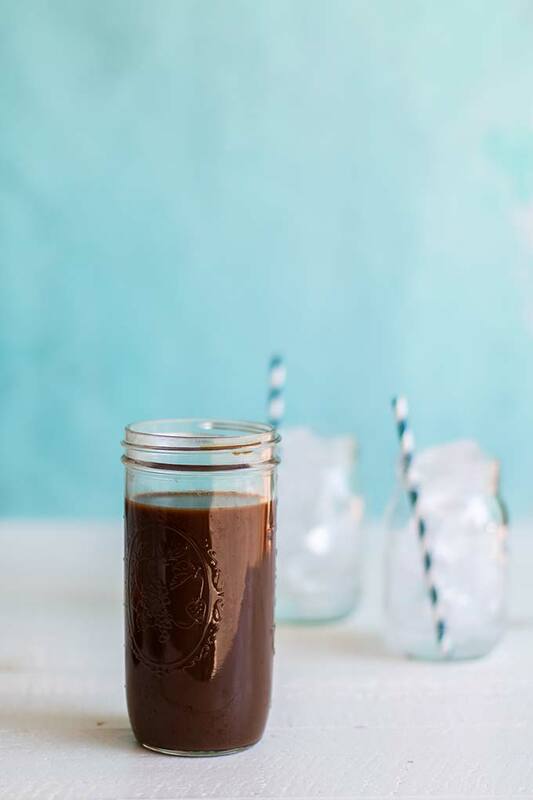 When ready to enjoy, add the coffee concentrate to a glass with ice, and then top with your favorite milk. I like about 2/3 coffee concentrate to 1/3 almond milk. Adjust to taste. For chillier days, reheat the coffee concentrate and add warmed milk for a hot mocha latte. I like to warm my almond milk and then froth it in the blender for a foamy coffee drink. This Salted Caramel Mocha post contains affiliate links, meaning if you make a purchase, I will receive part of the sale as a comission. This helps me continue to bring you lots of fresh and inspired recipes! 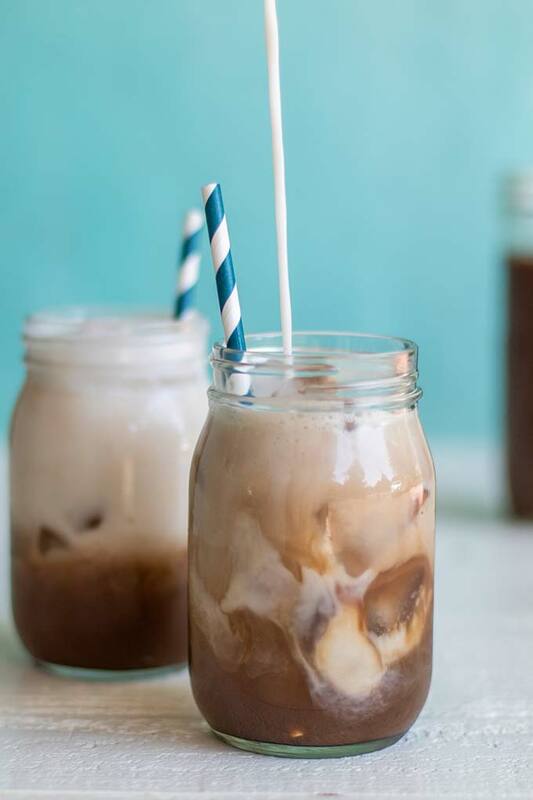 This iced coffee looks amazing! Thanks Jess! It's a great change up from my normal black coffee. If you've never tried coconut milk in coffee- that's what I used in these photos, it's a great addition. It's naturally sweet, and leaves a subtle coconut flavor. That Starbucks gets me all the time. They are every where! They recently added one into our grocery store. I can hardly walk in the door without wanting a coffee. Very smart to make your own version at home and save some money :D This looks delicious and so refreshing! It's so convenient, and Starbucks has put a lot of money into researching how to make the coffee shop a place people want to be. The staff at all the Starbucks around where I live know me, so sometimes I come and sit at their tables outside, they say hi to me, and don't mind that I don't order. Yes, I must know what's in my food, because I am allergic to so many things. But learning what's in things has made me even more picky about what I will and will not eat! Your photographs are amazing. I am not a big coffee drinker but that looks really good. You would like this! I know you. Haha, the glasses are probably from too far away from you-- I'm living in Kuala Lumpur, and I bought them at a restaurant supply store near where I live.This recipe is one of the ones I make more than anything else on my blog :) It's a great treat, and I prefer the sweetness of dates to any other form of sugar. I love these coffees-- I'm glad you like it! Hello Lynda! Thank you for pointing out that error. I always start with 1/4 cup because the dates blend better that way, and then I add the rest and mix it quickly before I strain. I just updated the recipe :) I hope you enjoy!